Last we I discussed several aspects of using batteries. This week I’ll discuss battery charging related issues and wrap up with a couple of physical considerations for battery usage. Charging – A thorough discussion of battery charging would take a book several times the size of this one but there are a few basics you should understand about battery charging. The first thing you should be aware of is each battery technology has certain charging algorithms that are optimized for that technology. Using an algorithm designed for a different technology can have results ranging from poor charging to disastrous (back to smoke and flames again). The basic parameters of battery charging are voltage, current and time. In general, the higher the voltage and/or current the shorter the charging time and each battery technology will have limits on the maximum voltage and current. Some types of batteries respond well to charging with high current pulses while others won’t. Some will benefit from a trickle top-off charge while others won’t. Fortunately, a number of semiconductor companies have battery charger chips for specific battery chemistries so you don’t need to get bogged down in this particular detail. Charge duration vs battery life – It is somewhat important to make a distinction between charge duration and battery life. Charge duration refers to the length of time from charging until the output reaches the cut-off voltage. Charge duration can be impacted by improper or incomplete charging, load, temperature and battery age. All batteries have a finite useful life (based on number of charge cycles or age) and battery life literally refers to the useful life of a battery. Battery life can be impacted by aggressive charging and over charging, exceeding the maximum current rates and using the battery below its rated cut-off voltage. Long charge duration and long battery life are not mutually exclusive but to achieve both you must treat a battery gently. Deep discharging to increase charge duration will reduce the life of a battery (as will very aggressive charging algorithms). Particularly in the case of LiPo batteries, the discharge curve is so steep when the cut-off voltage is reached there is minimal benefit and a high penalty in battery life reduction for going below the cut-off voltage. The term “battery life” is often used when referring to charge duration but when discussing ways to save power, what you do to increase charge duration will generally lead to longer battery life too. Self-discharge – All battery chemistries suffer some amount of self-discharge over time. This generally isn’t a concern as far as your product design is concerned. However, electronics have reached such low current levels that the battery’s self discharge may play a significant factor in your product’s charge duration and may even be higher than your product’s discharge rate. State of charge – One of the trickiest things about using batteries is determining their state of charge. Simply monitoring the battery voltage level is the simplest method to implement but often tends to provide poor results. A lead-acid battery that hasn’t been fully charged will have a fairly high voltage that drops rapidly when a load is applied, giving the impression the battery is discharging very quickly. A lightly loaded lithium polymer battery has such a flat discharge rate that there won’t be a significant voltage drop until there is only 5-10% of capacity left. A battery “gas-gauge” chip can provide a better indication of the state of charge but you still have to characterize the battery in your application to properly make use of the information the chip provides. Physical considerations – There are a few physical considerations you must take into account in your product design when using certain types of batteries. For example, some types of batteries may out-gas during charging (usually a sign the battery is being abused) and require venting to the outside world to avoid explosion. The lithium based rechargeable batteries can literally swell during charging and require some amount of room to expand. Battery manufacturers usually provide information if special considerations are needed. If you are new to designing battery powered products, it will be well worth your time to do some in research into the various battery technologies Even if you are an old hand at designing with batteries, if you are considering a battery technology you haven’t used before for you product you should do some in depth research in that technology to understand it’s intricacies. Manufacturers of batteries intended for industrial applications or OEM use generally provide considerably more details in their spec sheets than those for consumer oriented batteries. These spec sheets and app notes are a good source of valuable information. For the most part, your application will dictate the type of battery you use. In some cases you may have a choice of battery types or may have to decide between battery types when more than one would be suitable for you application. 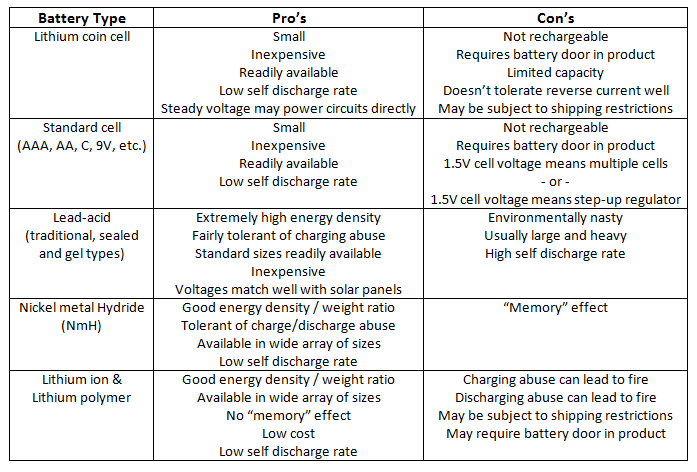 Below is a high level overview of the pro’s and con’s of the most popular battery types. This entry was posted in Uncategorized on September 9, 2013 by Mike. Thank you for the feedback. I’ve been thinking about Twitter but haven’t done anything about, sounds like I should. May I ask how you found the blog?